This cane is carved to order and will take 6-8 weeks for completion after your order is received. Superb hand carved terrier country walking stick with a choice of shaft mounts and finishes to making your chosen sporting/ country stick unique to you. 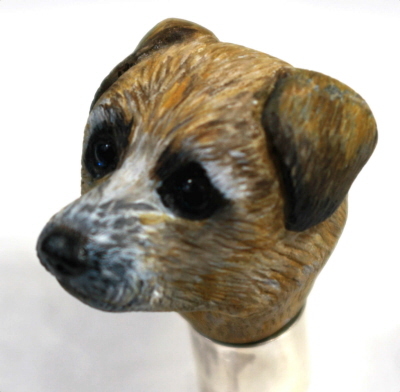 Beautiful hand carved study of a terrier from lime wood. 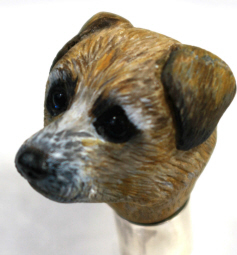 This beautiful terrier has glass eyes with hours of hand painting and finally sealed to achieve the fine fur texture. 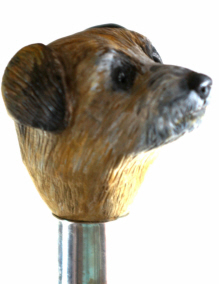 The terrier study country walking cane has a choice of collar finishes be it a standard nickel plate or brass collar. Alternatively, for something more special we provide a hand made sterling silver collar with full Assay Hallmarks for London. Alternatively, a hand planished copper and sterling silver collar. The terrier mounted on a chestnut shaft. You have a choice of stained chestnut in the colours blue,green or red/amber. Alternatively, we have some beautiful apple or chestnut shafts that are oiled and ready to go. We do have a small amount of very weighty chestnut shaft with a maximum diameter of 26 - 30 mm if you want a more weighty cane. Please note the carving is developed around the size of the cane and cannot be modified at a later date should you wish a different cane. In addition, you have a choice of the type of base ferrule in relation to your requirements. A rubber ferrule arrives as standard. Again for a more specialised country walking cane,we offer the addition of a the combination - spike with rubber ferrule. The cane is made to order with an arrival time of approximately 6-8 weeks. We require a deposit of £50.00 on ordering. Please select Call Shop With Your Payment Details when ordering online. For International deliveries please contact us first to have an up to date shipping prices as these canes are outside our standard shipping size.